When and why did you first become interested in gymnastics? I became interested in gymnastics around 2 years old because I found the flips and twists so cool and I wanted to them myself. Do you have any good/funny memories from when you first started taking gymnastics classes? When I was younger, our gym hd just gotten a treadmill for cardio. I was the second person to try it and when I got on, I started running, then all of a sudden my legs stopped moving, then I found myself flying across the gym floor and everyone was laughing! When did you decide you wanted to compete? And, when did you want to compete at a high level? What about competition appeals to you? I knew I wanted to start competing right away. So, I started competing in level two when I was only 3. I love the rush that I get when I walk into the competition. What is your training regimen? Was that a big change when you made the switch to competitive gymnastics? My normal training day consists of an hour of bars, then 30 minutes rotations for vault, beam, and floor, along with condition and beam/floor dance. So, my training day is about 4.5 hours long. When I first started competitive gymnastics, I knew I had to start working on my form, because when I was young, I never wanted to be tight or point my toes so I’d just flop around everywhere. What music do you use for your floor routine? I use Gabby Douglas’s floor music from Jesolo in 2015.
Who is your favorite gymnast or who is your “idol”? I love Shawn Johnson! How have you grown as a gymnast during your career, both skill wise and mentally? I have grown so much! At my gym, they’ve helped me learn all my skills. Of course, at first they were not very good, but as they kept working with me, my skills cleaned up and are now pretty consistent. Mentally, I think I have come very far. When I first started out, I thought I’d ever get as far as those “amazing level 10’s”, yet I am among them. How has gymnastics helped you as a person? Without gymnastics, I don’t know where I would be. Gymnastics has given me great time management, due to balancing school and gym. Gymnastics has also kept me very organized with everything I do. If you had to select one life-lesson that gymnastics has taught you, what would it be? One life lesson gymnastics has taught me is that no matter how hard things get, you always push through because that hard “thing” could end up being the best thing that has ever happened. What are your biggest accomplishments or best memories in your career? My biggest accomplishments in my career have been qualifying for the HOPES elite championship 4 times and being 1st on vault and 2nd on bars. For J.O., I have been to Nationals 3 times. I am so proud that I will also be going to Michigan State University in 2020. 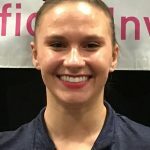 For my whole level 10 career, I have been striving to qualify Nastia Cup, which I finally did in a recent meet in Orlando. What grade are you in school, and where do you go to school? I am in 9th grade, but graduating early. I am going to West Boca Highschool. What are your goals for the future, both as an athlete and after you are finished competing? Compete in college and Med-School for Orthopedics, Orthopedic Dr, Surgery. When you’re not in the gym, how do you enjoy spending your time? Do you have any hobbies or favorite activities? I like to go swimming and hang out with gym friends. What is your favorite movie? My favorite movie is The Greatest Showman!! What is your favorite book? My favorite book is To Kill a Mockingbird. Are any of your family members current or former athletes? Mom: Swimmer, Dad: Football, Baseball, and Track, and Sister: Gymnast and Basketball. What’s on your IPod right now? What type of music do enjoy listening to? How about before a meet when you’re trying to get focused and pumped up? I mostly listen to “Today’s Hits” on Pandora because I love todays artists and their songs get me in the competition mood.